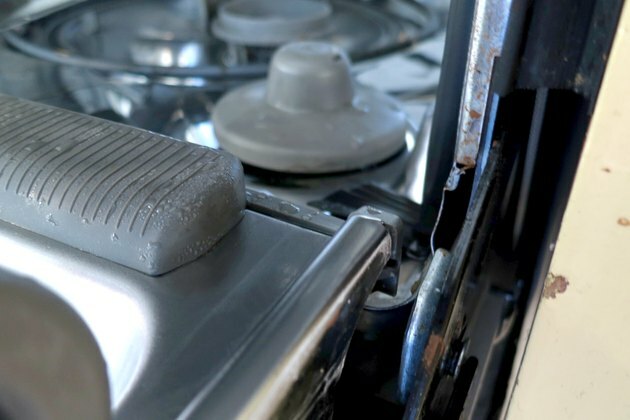 Your dishwasher cleans itself out every time you use it to wash the dishes, so you might not expect it to be a breeding ground for mold and mildew fungi and bacteria -- but it is. Certain types of fungi grow on food that collects in crevices, and others grow on rubber parts, including the gasket and drain seal. All bask in the dishwasher's moisture and temperate climate. Control requires disinfecting, cleaning and ventilating. Sixty-two percent of dishwashers on six continents harbor some form of fungus, according to a study published in Medical Mycology, and some are known to be harmful. Besides exotic fungi, common forms -- which include household mold and mildew -- also grow there, as well as yeasts, such as Candida. 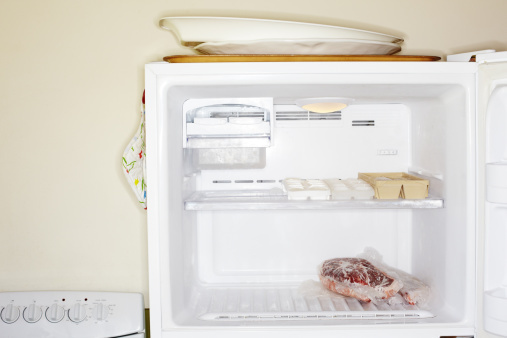 The rubber door gaskets are ideal places for these fungi and yeasts to grow, and the organisms are hardy enough to withstand dishwashing detergent and the high temperatures in the dishwasher during a typical cleaning cycle. They can also collect on other plastic or rubber parts, including the drain strainer, rotor and racks. 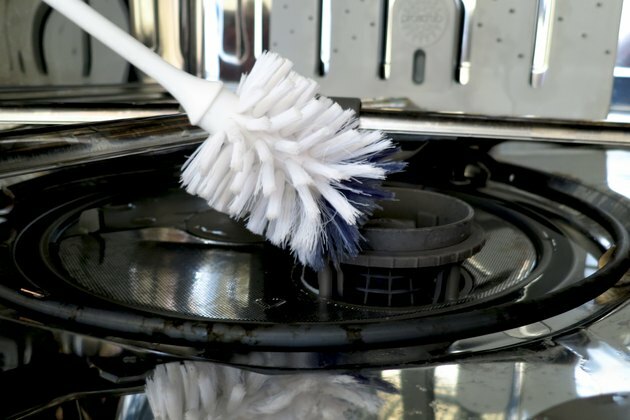 Cleaning the inside of the dishwasher with bleach is one way to kill mold, but bleach has disadvantages; it is caustic, and it may not be as effective against a wide spectrum of fungal growth as previously supposed. A mixture consisting of 3/4 cup household bleach per gallon of water is effective on non-porous surfaces, such as the inside walls and other hard plastic parts of a dishwasher. Its high surface tension, though, prevents it from penetrating porous materials, such as rubber. If you use bleach, provide plenty of ventilation and wear rubber gloves. 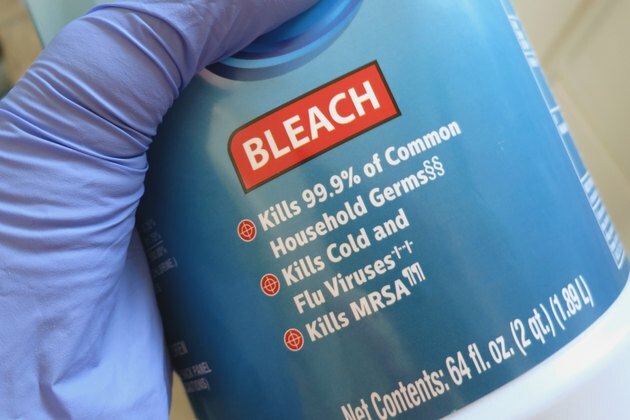 Instead of bleach, government agencies and cleaning professionals recommend cleaning mold with dish or laundry detergent and water. • Remove all the racks and clean them in the sink. • Mix a soapy solution and use a sponge to physically clean mold from the inside of the dishwasher. • Clean the rotor and drain strainer, which also come off, in the sink along with the racks. • Scrub inside the drain opening with a bottle brush. • Scrub the door gasket with a toothbrush; clean both sides, folding it out to reach the toothbrush behind it. 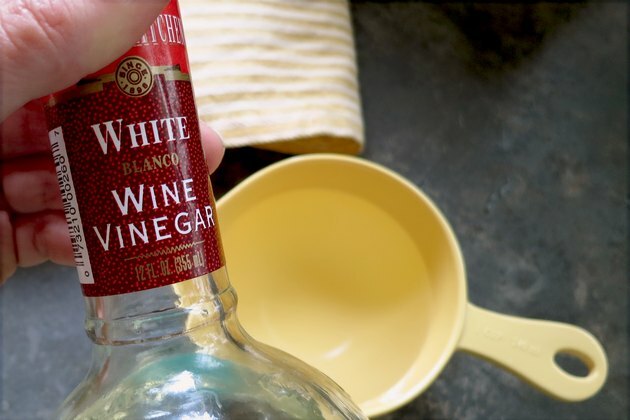 Vinegar kills 99 percent of bacteria and 82 percent of mold species, and it's safer to use inside the dishwasher than bleach. Spray vinegar on all the surfaces you clean or add a cup to the detergent solution you use for cleaning. Baking soda also removes stains and deodorizes, and a paste made with water helps clean the gaskets and drain. 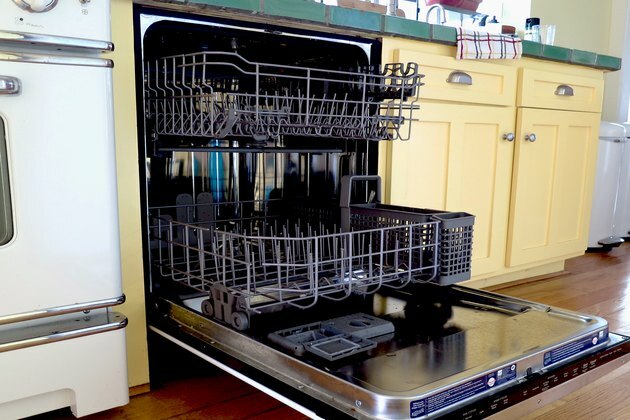 To disinfect your dishwasher, put a cup of white distilled vinegar on the top rack and run the dishwasher through its hottest cleaning cycle. Another way to prevent mold growth is to keep the door ajar when you aren't using the dishwasher; that provides ventilation that dries the surfaces so mold can't grow.